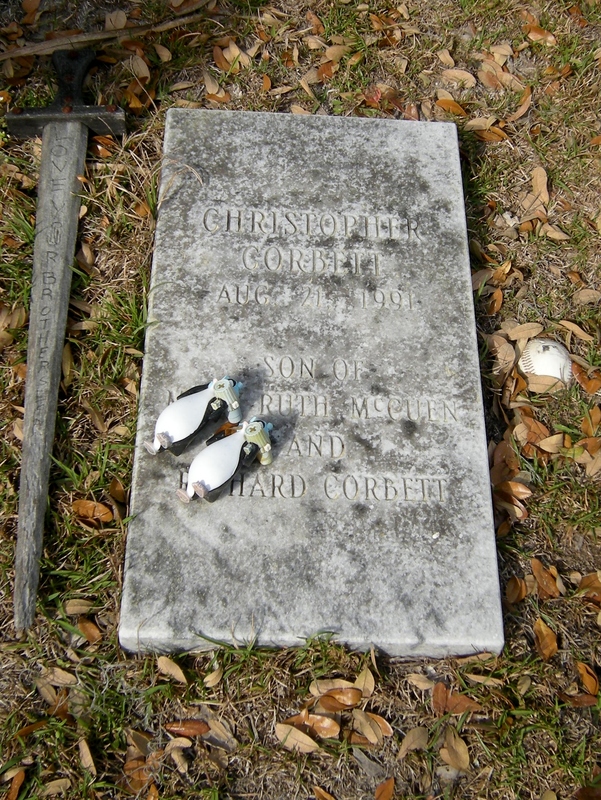 By the time we arrived in Savannah, it was after 4 pm, and we went to Bonaventure Cemetery, which would close at 5 pm. Locals who achieved fame, Johnny Mercer and Conrad Aiken, are buried there. There are no guided tours and we wouldn’t have wanted to go on one if there were. We just wandered around, enjoying the statues and ornamentation on some of the graves. It’s common to have a stone frame around the grave instead of just a headstone. Many graves were like this. Many family plots were also delineated with a low stone wall or border. Cairn built with stone used in a church of Scotland in the late 1600s. Sad – this baby was either still born or lived less than one day. This is his grave marker, and after more than 20 years, it is still visited and adorned with toys. More children’s graves. Many of the graves in this cemetery have stone borders around the grave itself. There were bright pink azalea bushes in bloom in several places in the cemetery. Amelia was honored with this ornately carved cross. This ghost-like tree would be scary to come across after dark! Side by side, husband and wife. Angel statues adorn the Bliss family plot. 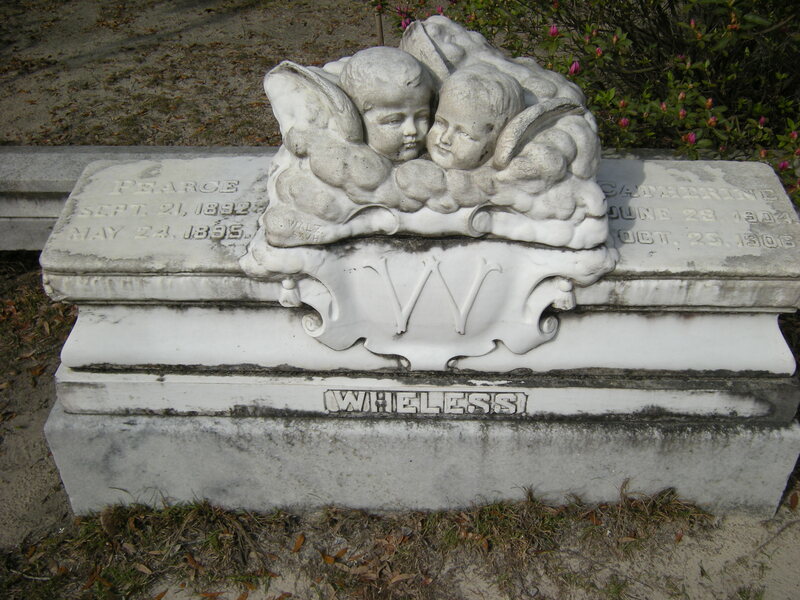 The cherubs in clouds lend poignancy to this grave of two toddlers (siblings) who met untimely deaths. More graves marked by borders. There are no headstones; instead the names and dates are written on the stone frames. The Runner – this is quite a memorial that was erected to honor this 56-year-old woman, Julia Denise Backus Smith. Next to Julia is another grave of someone who died “from injuries received while on duty during a gale” at the age of 27. This has interesting carvings but I don’t know WHAT it is supposed to be! The name SCHAFER is carved on the surface. When I looked at this gravestone, it looked to me like a face with penetrating eyes and a mustache, (somewhat catlike) but in fact it is just a design. The words have been somewhat eroded, but this seems to be the grave of a husband and wife. This rock is topped with a carving of leaves. Very unusual and original! Cemeteries fascinate me because every family buried there has a story. Hints are provided by the design of the plot and epitaphs on the graves. The details are meaningful to the surviving family members. I like to speculate on these departed loved ones’ life stories. This grave was the saddest of all: no headstones except a small pillar and a sign reading “Nugent 1919 3 Burials”. Blossoms among the Spanish moss on this tree. Layout of the cemetery. This might have been useful to encounter at the beginning, but I found it confusing. Still, it is interesting to see the large number of plots that Bonaventure has. Thanks for sharing! I had wanted to venture over to Bonaventure but did not have the time on this past trip.